Yep, on my last post I used this photo and the video below too..but it’s all I have of them! KENSOSHI ケンソウシ is a J-rock/J-pop band that I absolutely adore, even though I’ve only really heard 1 of their songs. Weird? Sort of.. lol But let me explain! First off, although in this photo you see only 3 members, it’s actually a group made up of 4. I’m sad that Yo, the drummer got hidden behind in the photo, but I’m hoping 1 day I’ll get to take another photo with all 4 of them together. 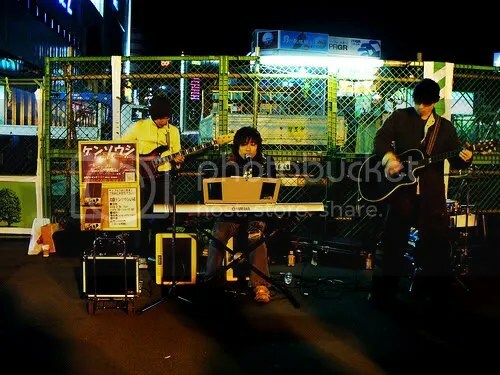 So on my Spring Break trip to Japan, my friend Em and I were getting out of the Shinjuku Station on our 2nd day there and ran into these guys doing a street performance. Even though we had a long day and were super tired, when I heard their music play I had to stop and listen. I loved it so much that I recorded it and made sure I also took a close up picture of their sign, that way I could return home and get someone to translate their band name for me! As for recording videos, I don’t do it too often, so this REALLY caught my attention. 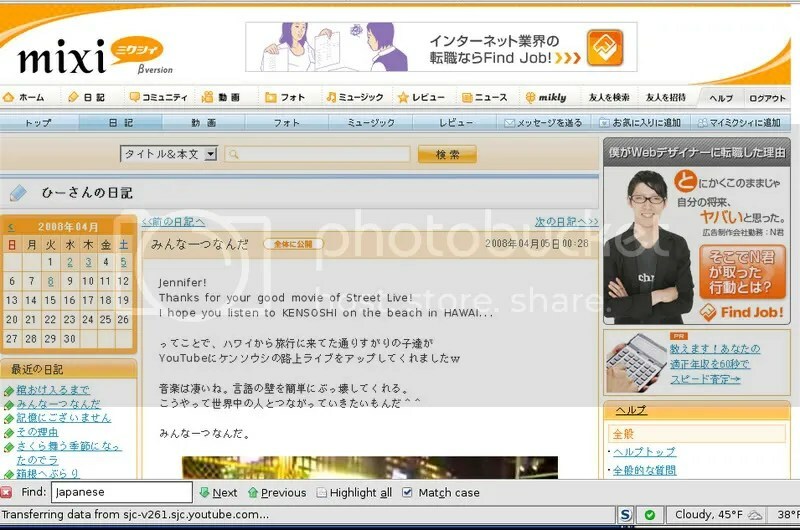 Once I got their band name KENSOSHI ケンソウシ translated, I got her to translate the page that would allow me to email them! I chose a random guy (Hiro) and emailed him the photo I took and the video I uploaded onto youtube of them, telling them that I was from America and loved their music. Overall, all the messages from the members were super nice =D There was a minor mix up though because they assumed I was from Hawaii lol…and I believe that is because in a youtube video I uploaded of Em and I goofing off, I was saying how Kamogawa looked like Hawaii >_< In the end, I emailed them back and I got that corrected haha… Currently, the staff is looking into how I can purchase a CD and getting it shipped to the states. Also, Hiro from KENSOSHI told me that some of their fans found my video and also liked it ^^ Plus, I noticed that my video was being linked on some mixi’s (basically a popular Japanese type facebook/myspace), so I got Symons to investigate! Apparently, 2 of the KENSOSHI members posted blogs about me contacting them and the video! If you go to their website by clicking >here<, you can be linked to their discography on their official page, which will allow you to sample some of their other songs! I recommend you use the Internet Explorer instead of Firefox for it to work better..plus it might be hard to navigate around because it’s all in Japanese. I apologize for this being so long lol… I had high intentions on making this short but I didn’t know what to cut out! Wow I think thats a cool story. Music really is the universal language. I’m just looking at your photos, im not reading the text. you can tell me about it in person!! Too bad, people can’t really do that on the streets of Seattle! Cool coverage. Hi, I’m one of the people that from Hawaii that Kensoshi had mixed you up with. 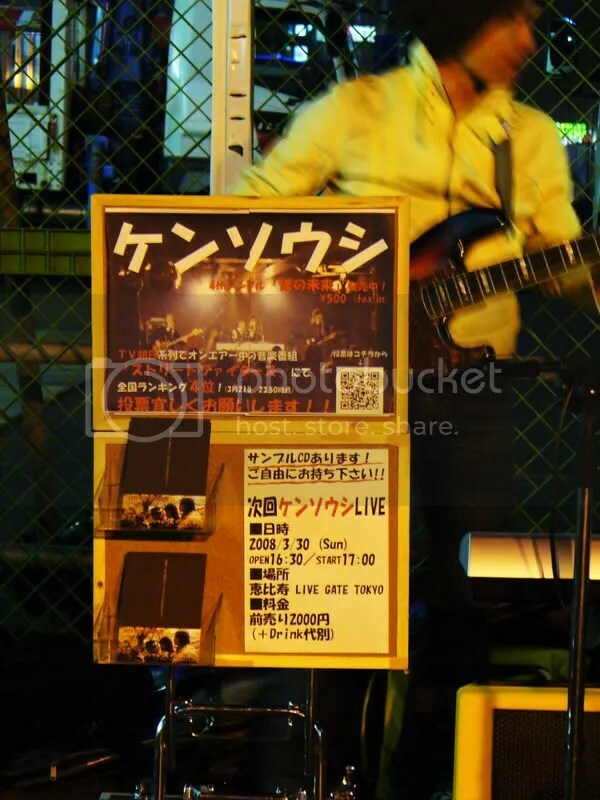 I saw their live performance that night at Shinjuku also and I got their CD because I really love that song you like, Koe Kaze. I was checking on ケンソウシ since I wanted to know how it was going for them. And stumbeld across your site. The Guy: what?! no way!? wow…ever since I posted this , I’ve made made a bunch of small world incident it seems~ =D what a little planet we live on. Do you live in Japan? Or were you visiting? It’s a smal world inded. At that momen I was living and studying in Japan but I went back to Sweden in April.